There are many commentaries available on the Psalms. Many of them make use of the latest insights of “critical scholarship” by which is meant an interpretation which attempts to stay within the boundaries set by the science of history. Much can be learned from such an approach. Such interpretations remain at the surface of the Psalms and do not do much to feed the soul. They may be said to “set the table” but the nourishing occurs when mystical interpretation takes place. In the latter half of the 19th century St. John Mason Neale set out to provide a commentary on the Psalms which would be an interpretation which assist living through the Psalter. This is evident when he wrote in the foreword to the first volume of his commentary that “my connexion with the Sisterhood of S. Margaret’s, at East Grinstead, involving the weekly recitation of the Psalter, tended to make me more willing to persevere in the task in real earnest” (J.M. Neale, Commentary on the Psalms, Vol. I, p. viii). The task being to continue his commentary. Iow the commentary was written from ” place of weekly recitation of the Psalter” and, one may safely assume, is intended to support such a use of the Psalter. The commentary makes use the writings of the Church Fathers but also, significantly, of liturgical principles to unveil the hidden nourishment contained in the Psalter. The Office of Lauds could serve us as an example. This Office consists of five Psalms on both Sun and weekdays. On Sundays, the celebration of which hinges on the resurrection of Jesus Christ, the first Psalm is XCIII (93) “The Lord is King and hath put on glorious apparel.” It is easy to see how this verse could lead the reader to think of the resurrection and so beging praying the Psalter with the resurrection in his heart. On weekdays the first Psalm is always 51. This allows the one saying the Office to repent from the night of sin to the day of redemption – Lauds being said after Matins begins in the dark but ends at the rising of the sun. 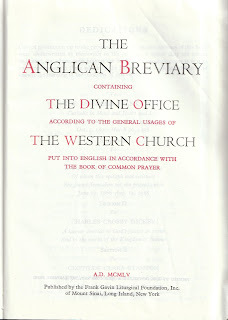 In the Psalter distribution of the Anglican Breviary Psalm 51 is used for Lauds 2 with a similar effect. The sunrise itself being a symbol of the resurrection. The glory and joy of the resurrection is sung by the recitation of the last three Psalms of the Psalter: the Laudate Psalms so named because they are characterized by the praise of God. The above is, of course a highly symbolic, allegorical or “mystical” reading. A historical reading it is not. The reading moves from the outside to the inside so to speak. Or to speak in St. Paul’s terms from letter to spirit (2 Corinthians 3, 6.). This implies, at least, two levels of understanding of the same Scripture. A literal and a spiritual. And it is here that some might begin to suspect a platonic distortion of the Gospel. Plato, as is often assumed, believes that reality is to be explained as consisting of two worlds or realms. The first realm is that of material reality which turns out to be not really real, but only derivatively so. The really real is the realm of spirit, of the ternal unchanging forms. To get to the truth of things, we must pass from the, lower, material realm to the higher, spiritual realm. So a reading on two levels could be argued to be a platonic distortion of the Scripture that the Breviary is leading us toward. But it gets worse. In 553 an Ecumenical Council was held in Constantinople and the gathered bishops put their signature on 15 anathemas condemning Origen and Origenism shortly before the council opened. The anathemas condemn what appears to be a platonic distortion of christian theology. The alleged platonism resides precisely in its dualism, in its contrasting of two realms: spirit and body. A prime example of this is the condemned belief in the so-called preexistence of souls. In the version attributed to Origen a spiritual realm of pre-incarnate souls (like forms which also exist in a spiritual, and dis-incarnate realm) is disturbed by sin and thereby falls into bodily existence (not unlike the prisoners in Plato’s cave). The body is perceived as a prison for the fallen soul. Salvation cosnsists in the escape from the prison-body to return to the dis-incarnate state (to rise from the sensible world to that of the forms). The above is a summary of a popular myth concerning the Platonizing of Christianity by the likes of Origen. Even today adherents of such myths can be found. Some of them are well-respected biblical scholars. The latter enjoy painting a platonizing strawman and knocking it down with their superiour (because biblical) insights. A good example of this method is to be found for example in Bp. N.T. Wright’s Surprised by Hope. In the following posts I will first suggest a different, more coherent, reading of Plato and move on to do the same for Origen. Once this is done it will be clear why I believe mystical interpretation is by no means alien or distorting but is natural and biblical.